The Midwest harbors many fascinating many mounds, burial sites, and historical landmarks - some are even located in Wisconsin. 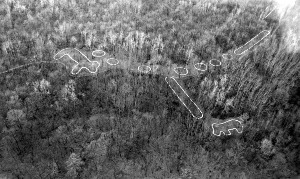 One mound site in Wisconsin is located in the small town of Aztalan. Aztalan was discovered as a historical landmark in the 19th century when charred bones were found in several locations. Scientists hypothesize that these charred bones are evidence of cannibalistic rituals or the remains of long-forgotten mortuary practices. However, at the time, archeologists did not believe ancient Native Americans had the technical skills to build complex mounds and dismissed the discovery. Today, site caretakers have built a wooden wall the mimics one that existed in pre-Columbian times. Visitors can now get a sense of the ancient city’s size and learn about its rich history. Another ancient mound site is found in Elkhart Lake, Wisconsin. There, farmer Gary Henschel owns a museum called the Hensel’s Indian that is filled with artifacts recovered from his land. The site was discovered by accident in the 19th century. As the story goes, Gary Henschel’s grandfather was plowing one day and his horse fell through the ground into an ancient effigy mound. Inside, a circle of skeletons faced a shell from the Gulf of Mexico, indicating trade with Southern tribes. Henschel believes the mound is astrologically aligned and represents significant animals in Native American culture. Mound sites are found all around the Midwest. In Illinois, Cahokia Mounds State Park once had about 120 mounds. But, as St.Louis expanded, many of these mounds were bulldozed. Cahokia had many residents, temples, and burial sites. In the 13th century, Cahokia was abandoned for unexplained reasons. There are no written records so we do not know how they lived or what their regular activities were. Cahokia has a group of wooden posts in a circle called Woodhenge. According to scientists, Woodhenge was used as an astronomical calendar with each wooden posts marking the locations of equinoxes and solstices. There are many historical mounds, pyramids, and burial sites dotting the Midwest. While the sites tell a fascinating history, there is still so much to learn about the ancient inhabitants of America’s heartland.